Another dish that I love, but is not one of my wife's favorites is Kofta with Tahini sauce. There are a lot of strong flavors in it, and they all blend together very nicely. At it's most basic, it's a ground meat and potato dish, but it gets its flavors from the middle eastern spices and the tahini paste with lemon juice sauce. Before I get into the process, there are a few special ingredients you need to acquire, and you might have to get them from a specialty store, possibly even a middle eastern market. If you can't find them, you can do some mixing (in some cases) and some substitutions. One ingredient you really can't substitute is the Tahini Paste. It's like all-natural peanut butter, but it's made from ground sesame seeds. I can usually find it in health-food stores. It has a strong, nutty and almost bitter edge, but when combined with the lemon juice it's just plain amazing. If all else fails, you can use Allspice. It won't be the same, but it's still good. A third issue is the meat. Most of the time I've eaten this it's been made of ground beef. This time, I tried it with lamb, and I think that made a big difference to the overall success of the dish this time. Of course, lamb is pretty expensive. In theory, you could use any ground meat, even turkey. No self-respecting muslim would use pork, of course, but if you're a christian, or an atheist, go for it. I first cooked this dish way back in the early days of Mark's Black Pot, and I've only done it once or twice since then. It was taught to me by a Palestinian friend and his wife (who also provided me with the jar of home-mixed baharat). It all started by lighting up some coals, heating up the oil in the dutch oven, and sauteing the onions and the garlic. Once those were browned and translucent, I added the potatoes. I stirred them to coat them with the oil and salt, and put the lid on. I didn't shift the coals to the top yet, though. Then I made the meat mixture. It was pretty simple, I just added all of the ingredients together and mixed them all up. Traditionally, the meat is formed into elongated meatballs, almost finger-shaped. Then, I mixed up the tahini sauce. This was a little trickier. The amounts are estimates. I stirred in equal amounts of water and lemon juice, but only a bit at a time. You want two things to happen: One, it needs to come to a thick soup-like consistency, and Two, it needs to balance the taste between the lemon and the tahini. Words can't describe that balance, you just need to taste it along the way and see when it all blends right. I just kept adding juice and water until it all looked and tasted right. A pinch of salt will also help bring out the flavors. Then, I opened the dutch oven lid and arranged the meat sticks on top of the potatoes and onions. I poured the tahini sauce over it, and then dashed in about a quarter cup more water. I adjusted the coals to the right amounts above and below for baking, and set it to cook. It cooked for about 45 minutes or so. After about a half hour, the meat was getting cooked through, so I stirred it up. If you stir it up before that, it'll all break apart. When the potatoes are done, it's finished! I also pulled out my 8" dutch oven and cooked up some rice. I also made some of that cucumber and yogurt salad that was in that first blog entry I did when I made this in my dutch ovens so many years ago. This time, however, I didn't have any tomatoes. It was so much better this time than I'd ever made it before. I was in heaven. Even Jodi said it wasn't too bad when she came home. My wife went out of town this weekend, so I took that as an opportunity to cook a couple of things that she normally doesn't like very much, but which I, myself, really love. One of those is a big ol' loaf of Dutch Oven Sourdough Rye Bread, so I can make my infamous braunschweiger and cheese sandwiches. The other is the Dutch Oven Kofta bi Tahini that I cooked up soon after starting up this blog. I really like a nice, sweet, flavorful white bread, but once in a while, I get rebellious. I love the edgy, sharp flavors that a good rye bread brings. Add some good, tangy meat and sharp cheddar, and you get a sandwich that bites back. Yum! While I pretty much followed the original recipes in the links, there were a few things I did differently. As a result, I'm going to rewrite the recipes and processes here in these posts. As always, I recommend reading my Dutch Oven Bread Baking Lens fiirst, for good basic information. It started up the night before, when I took my sourdough start out of the fridge. I poured off the "hooch" and mixed in some more flour and water. I needed to "feed" it to reactivate it. A few hours later, it was frothy and bubbly with yeast bugs. I scooped out about a cup, and put the rest back in the fridge. I put the frothy start in a bowl and mixed in all of the ingredients in the sponge set. If you check out the original recipe you'll notice one change. I moved the yogurt to the dough phase. I've been hearing/reading that fresh (unscalded) milk and milk products contain enzymes that can inhibit the rise. I covered it with plastic wrap and set it aside on my kitchen counter for the night. The next morning (not too early, though), I mixed in all the ingredients of the dough set. I used Pero for the roasted powder. I really like the flavor of it. I like the flavor cocoa brings, as well, but this time I chose Pero. Postum is good, but I think it's not being made any more. Between the rye, the powder and the molasses, it gets a nice, rich, dark color. Not black, just a deep brown. Then, I kneaded it on a floured tabletop, and kept adding flour until it got to the right stickiness, and until it made a good windowpane. I set it aside to rise, oiled and covered in plastic wrap. Go outside and light up the coals. Mix them occasionally to make sure they all light pretty evenly. While the coals are lighting, I come in and degas the bread dough, and shape it. Now, most of the time I'm making a boule, so there's not much "shaping" going on, but sometimes I'll do rolls or four smaller boules. I used to like doing a braided wreath, but it's been a while since I've done that. Oil the inside of the dutch oven and set the bread in to proof. Once the coals are ready, I take the dutch oven lid outside and pour a lot of coals on top of it, and set it aside to preheat. When the dough is proofed in the dutch oven (meaning it has risen some more), I do any decorating or topping, and slicing of the top. Finally, I take the dutch oven out. I take some of the coals off the lid to make the undercircle of coals and I set the dutch oven with the bread on the circle. I put on the lid, and mark the time. Every fifteen minutes or so, I rotate the lid and the oven to prevent hot spots. I check the temperature by holding my hand over the top of the oven and use that as a guide to see if the coals need replenishing. I'll check the underside coals to see how they're burning. After about a half hour of baking, I'll open the lid and check on it. At that point, I'll usually stick a thermometer into it and close up the lid. I try not to have the lid off for very long. A few seconds really. The next time I rotate the lid, I'll lift it for a few seconds and check the bread's internal temperature. 180 is "gettin' close". 190-200 is "done!" So, I followed the pattern, brought it in, and let it cool on my new cooling racks (I don't know how I did bread before I had those). Delicious stuff! Just check the pictures! As they prepare for this year's World Championship Dutch Oven Cookoff, at the Sportsman's Expo in Sandy Utah, each cooking team has to submit their recipes in advance. This is for two reasons: One is to have them be verified to make sure that they comply with all the rules, and the other is so that all the recipes can be compiled and published in an annual cookbook. Now you have a chance to cook with the greats! For only $15 (+ $3.50 S&H), you can have this commemorative cookbook, and see what's being made at the contest of the best Dutch Oven Chefs in the world. The Top Ten Reasons to Get Your Copy of the 2010 IDOS World Championship Cookoff Cookbook! It's sure to be a NY Times Bestseller. Someday. They've been tried and tested in competition. These recipes aren't bland ol' out-of-the box, open-a-can slop. Theyt're made-from-scratch culinary delights! Tired of adapting from your old Betty Crocker cookbook? These recipes are dutch oven recipes! What, you gonna learn how to cook watching "Chopped" reruns? You start off searching for recipes on the net, and somehow you end up watching Weird Al videos on YouTube. It's a timeless tome that answers the deepest question life offers: "What's for dinner?" It'll make you a champion cook in your own family, in your own back yard! So, get the book and try the recipes! Or, get the book, come to the World Championship Cook-off, and cheer on your favorite teams! In all seriousness, I got the book from last year's cookoff, and there are some kickin' recipes in it. Look over the recipe titles here, and you'll see that it's well worth it. It will also help support the worthy organization of the International Dutch Oven Society. Also, since the FTC now requires full disclosure, I must say that if you buy one, I won't make a dime. So, I made this roast yesterday, and it tasted great, but what I was trying to accomplish didn't quite turn out. I guess as long as it was good, right? I was shooting for a low heat, long roast, trying to get to that point where the meat just falls apart. I didn't quite get there, but, as I said, it still tasted good. The honey and balsamic glaze added a sweet tang to the meat, too. It was really delicious. I served it up with that bread that I baked the day before. All in all, it made for a yummy feast. I started out thawing the roast. It had been thawing in the fridge for a day or two, and I put it in the sink with some cool water. A hint I learned: Next time, I'll take it out of the package and off of the styrofoam tray, then put it in a ziplock before putting it in the water. The tray insulated the meat and it was still frozen on the bottom for quite a while. Meanwhile, I lit up some coals and pre-heated the dutch oven with the oil in it. I tossed in the garlic and let that sautee a little bit. Meanwhile, I coated the meat with kosher salt and coarse-ground pepper. I let it sit for a little bit, then put the roast in the dutch oven and browned it on each side. While that was browning, I cut up the vegetables. The potatoes and onions I cut into large quarters. My idea was to have those on the bottom and to rest the meat on top, that way the juices would run down under the meat. Once the meat was browned, I lifted it out of the Dutch oven, and put in the onions and potatoes. I scattered in the celery and the carrots to fill in the gaps. I laid the meat down on top of the bed of veggies and set on the coals. I also laid strips of bacon across the top of the roast. Since I was kinda learning how to do this, I also set a thermometer into it. I closed up the lid and put the proper coals on. My idea was to cook it at 200-250 degrees for about 4-5 hours. It took a while, but it eventually got up to 200. From then on, it was just a matter of keeping the heat steady with fresh coals. About an hour before serving time, I made the glaze. I mixed all of the ingredients together and dabbed it over the meat. The recipe reflects not so much the actual ingredients I used, but the ones I would recommend. The one I did ended up too peppery. You probably won't use all of the glaze at once, but after another fifteen to twenty minutes, you can add more to the roast. At about the same time, I got my basting syringe and sucked up most of the juices from the bottom of the dutch oven, and put them into my 8" dutch oven. I set that on top of about 8-10 coals to heat up and begin boiling. While that was getting boiling, I stirred up the flour and the water. I stirred it up pretty vigorously. The idea is to get out all the clumps, so it can pour into the juices and make gravy. So, add flour or water as needed to make the right consistency. Once the broth was boiling, I added the flour/water mix, a bit at a time. I stirred it in and let it boil for 5-10 minutes before adding any more. I've had problems making gravy where I ended up adding too much flour too fast and it got too thick. OK, now, I think I'm finally getting the hang of breadmaking. It's only been, what, three years? I may be slow, but I get there. 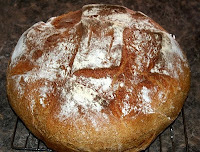 I used Jodi's sweet sandwich loaf recipe for dutch oven bread again, and I did a couple of things differently. One thing I did was to sift the flour. I'd seen Emeril talking about making pasta and he said to sift the flour to "aerate" it. That sounded intriguing, so I did it. The crumb did turn out very light this time, and that might be why. Otherwise, I did it just like I did before, except at the end, when I cooled it off on my new cooling racks. That also made a difference. The bottom crust was very soft and moist as I pulled it out of the dutch oven, and as it cooled in the open air, it firmed up a bit. When I finally broke it apart to slice up for sandwiches at lunchtime, it was light, but solid. Nothing doughy at all, like last time. The top crust turned out a little dark, but it was still pretty soft. All of that had to do with heat management. It's kind of hard to quantify that, but it's coming with practice and experience. I get to the point where I can feel the heat and know if it's good or too hot or cool. Use the heat guide as a start, and add or subtract from there. Tomorrow, I'm making a big roast beef for my Father-in-Law. That'll be fun. I've rambled on and on here from time to time about food and cooking as art. Art, in my mind, is basically a vehicle for personal exploration and expression. So, in order for an activity to qualify as art, it has to come from somewhere inside me and teach me something about myself, and then it has to help me share that discovery with others. I think I've only achieved that level a few times in my culinary life. Frankly, I've only done it a few times in song and even fewer in my efforts at visual art. But nonetheless, it is a challenge for me. That's one reason I keep trying. One thing that is for certain: it's very difficult to discover something about yourself, and even more so to express that self-awareness when you're cooking someone else's recipes. This morning, as I was catching up on other people's blogs, I came across a posting on "The Back Porch Gourmet" all about cooking without a recipe. At first, I thought to simply comment on his post, but I ended up thinking too much and so, I posted my own blog entry. Andy offers some great advice, and I would recommend following it. Here are my own thoughts as well. Second, watch the right cooking shows. Find shows that actually teach you techniques and skills, not just celebs that throw a few ingredients together. Find shows that teach you why these flavors work together and why you need to hold the knife this way. And don't waste your time watching competitive cooking. "Chopped" and "The Iron Chef" and other challenge shows are edited for the drama of the competition, not for learning new skills and getting cool ideas. My favorites are PBS's "America's Test Kitchen" and the Food Network's "Good Eats". Alton Brown is like the Bill Nye of cooking. He's teaching you about the science and the art of cooking, while being very fun to watch. Those two are on permanent record on my Tivo! Third, learn to hybrid recipes. When you want to cook a particular dish, look on allrecipes.com or recipezaar.com or your old family cookbooks and check out several differing recipes for the same dish. Not only will you learn the different approaches, but you'll pull one idea from one and other ideas from another. In the end, you'll have your own version of a popular dish. ...and (Fourth), while I'm talking about recipe websites, another thing I like about allrecipes.com is their ingredient search function. Sometimes, I'm looking in my pantry and my fridge, wondering what to cook in my black pots that week. I'll pull up a few ingredients and think, "Can I make something with these?" I'll jump to their ingredient search function and type in those ingredients. It pulls up a bunch of recipes using those ingredients. I read through them, and hybrid them, and come up with something. This is the process I used, for example, to cook my "Dutch Oven Apple Chicken Curry"
Another way to approach this is with culinary reference books, like "Culinary Artistry". This book is largely a list of ingredients, arranged alphabetically, and following each one is a list of other ingredients and spices that go well with it. Pick what you like, use reasonable amounts, and you've got a whole new dish! I used this approach when I cooked up a Salmon and Potatoes mix. Finally, be willing to experiment, and be willing to fail. Even as recently as last week, I made a pasta sauce for my parents (in the kitchen, not in the dutch ovens), that didn't turn out as well as I'd hoped. Learn from your mistakes. Cooking is actually very forgiving. Many things I've cooked that I've considered to be flops are actually edible, even tasty. They weren't quite as amazing as I'd wanted, but they were still good. I've only cooked a few things that I've had to throw away and pronounce inedible. Oh! One other thing! When you do create something new, share it! Post it to a recipe site, or make your own blog. Don't keep it to yourself. And share more than the recipe. Tell us what you learned and how you did it. Let us share in your art!